Climate change has been the buzz word for past few decades and the debate about it has gained unprecedented momentum in the recent past. It is not like that earth’s climate was not changing in earlier days. The earth’s climate has been changing continuously for hundreds of thousands of years. What has been the cause of concern however the rate of this change, specifically the earth’s temperature is. 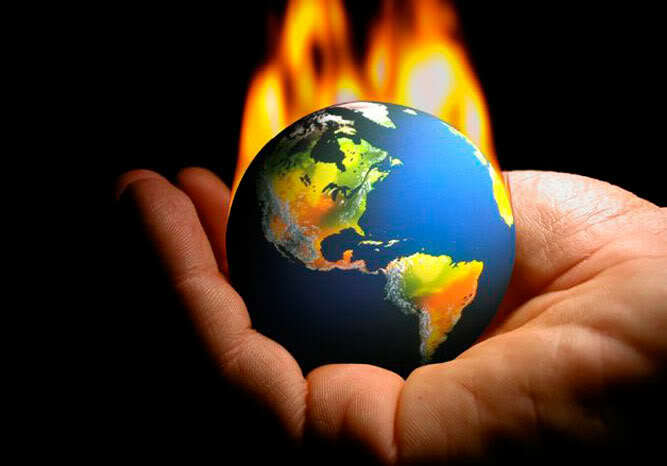 Why Temperature of earth is rising? In normal course, the heat gained by earth gets dissipated to the atmosphere, maintaining the general balance. But increasing concentration of greenhouse gases ( GHGs) like Carbon dioxide and other acts as a barrier to the dissipation thereby resulting in warming of earth. They simply block heat to escape to the atmosphere resulting in rise in the average temperature of the atmosphere. Increased draught related food and water shortage. As per current understanding of climate related risks, the likely impacts from climate change will have adverse consequences on the growth and development of the Indian economy. Considering flood risks and associated losses, India is among the top 20 countries most at risk from extreme events. Floods in Uttrakhand, Jammu & Kashmir and Chennai manifest this potential threat and India could experience an 80% increase in population at risk from sea level rise by 2050. Heat stress can adversely impact labor productivity and also poses a heightened risk of heat strokes in India. Particularly for those whose work exposes them outdoors for long hours such as workers in constructional and agricultural activities. Rising temperature also has impact on agricultural productivity. Rising air temperature is going to affect agriculture cycle resulting in low productivities of many crops such as wheat, Rice, Potato and Sorghum etc. One recent study project on overall decline in food grain production by 18% by 2050. In sum the impacts are projected to wide ranging and can impose a substantial economic burden not only on India but also global economy. Previous articleआखिर कब आयेंगे किसानों के अच्छे दिन ? Next articleआखिर ये लोग मृत्यु दंड क्यों खत्म करवाना चाहते है ? Hello, I am Satyam Prajapat. I am passionate about writing. Serving the society is the goal of my life. हिन्दू मुस्लिम के बीच खाई बढाते साहित्यकार-अब तो बस कर दो ! India faces one of the fiercest droughts in decades, farmers are under distress!